As trilobite collectors and preparators visiting many fossil shows and fairs we have had the chance to obtain some experience with fake trilobites. The knowledge we have gained over so many years allows us to quickly identify false material while it may be very difficult for others who are not so familiar with how fake trilobites are made. Unfortunately the trilobite market seems to be flooded with false stuff at the moment, the “quality” of which is getting better continuously, making it even harder to tell. We therefore, thought it a good idea to make our knowledge available to others in a way easily understood. Faking trilobites is not a new business. Repairing, restoring, adding to or plain faking of fossils is almost as old as the fossil trade itself. The problem being, as with most areas of collecting, that money can be made and sometimes has to be made due to lack of other options and wide-spread poverty. The famous 19th century trilobitologist BARRANDE, employed former quarry workers that where called “stone mens” to search the areas near Prague for trilobite specimens. Particularly interesting finds resulted in good money and some of those “stone mens” could not help but fail their employer and produce false trilobites in order to get more money for them. With the beginning of the trilobite trade at the end of the 19th century, many of these faked specimens found their way even into the collections of great museums around Europe where they are on display even today as refreshing curiosities (Budik & Turek, 2003). A favored way to fake trilobites was simply to assemble new specimens from parts, originating at times not only in different specimens but even in different genera, and thereby making the “trilobite” complete, resulting in higher prices when sold. Some of these “rare species”, which had been sold to museums and educational institutions, look quite grotesque in our time. There was, for example, a trilobite assembled from the cephalon of a Phacops, the pygidium being an Odontochile and the thorax consisting of merely 4 segments. (SNAJDR, 1992). However, at those times, the faked trilobites at least consisted of real parts. They were created in a “make-one-out-of-two”-manner but the parts were real. 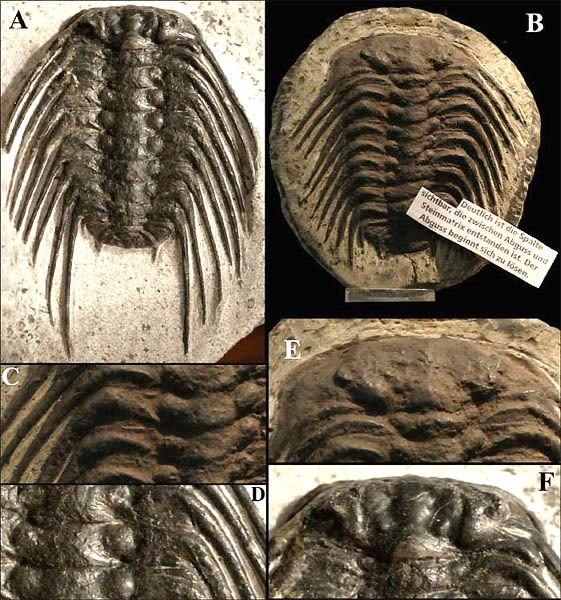 Fakes of this nature are created unto this very day, but the availability of resins made it possible to fake entire trilobites by simply casting them. Following sensational finds of large and bizarre trilobites in the Moroccan desert near Alnif, Erfoud and Tabourikt over the last three decades, a whole trilobite industry evolved. This happened in an area where education was scarce and the availability of electricity and running water restricted. Native Moroccans and nomads found a welcomed (if not their only) income in searching for and preparing trilobites. Over the years, trilobites have become an important economical factor in the poverty-stricken areas of the High Atlas mountain range where the Moroccan trilobites are found. According to Burkard & BODE (2003), there are well-known manufacturers in Morocco who produce fake trilobites or rather trilobite models. Fossil dealers who go to Morocco to buy trilobites are well aware of that and know that these trilobites are not real. Neither are these models sold to them as real trilobites but reproductions. The cheating does not start there, it starts when these reproductions are thrown onto the trilobite market in masses and sold as the real stuff for little money. Faking of this nature started in the 1980s due to increasing demand for giant Paradoxides and lack of the real thing. In the beginning, the old “make-one-out-of-many” was common, but very soon whole trilobites were faked. It is verified that it was not the Moroccans who started to fake trilobites but American as well as European dealers who inspired them to do so. The American and European dealers then sold the fake trilobites as the real thing. Meanwhile the faking has reached levels that include almost any known Moroccan trilobite species and it is possible that there is more false material floating around at this time than real! But the repairing, restoring or faking is not restricted to Morocco. It applies as well to some of the Russian trilobites coming from the St. Petersburg region, although the amount of faking is not comparable to that in Morocco. It applies as well to some of the Russian trilobites coming from the St. Petersburg region, that is also comparable to that in Morocco . The reconstructions are usually restricted to replacing missing parts of the exoskeleton, waxing and coloring of the carapace or the mounting of isolated trilobites onto matrix other than the one it was found in. But also the building complete specimens from pathials occur sometimes. I experienced this myself when trying to prepare the hypostome of a Dysplanus from the Lower Ordovician. The trilobite was completely real but mounted artificially onto a piece of matrix from the Asery level. Most likely it was done because a trilobite on a nice piece of matrix sells for a much higher price than an isolated specimen. From a scientist’s point of view, it looked as if this species from the Kunda level had still existed in the younger Asery level, which is not the case. It has to be said though, that the Russian preparators rarely play dirty. The trilobites are real but in most cases (Asaphus, Illaenus) are very quickly extruded from the matrix with high-powered blasters using very aggressive media so that the exoskeleton gets an unnatural shine. They look very nice when finished, but have most likely been polished and waxed and thereby lost surface detail. Looking at more carefully prepared specimens you will find the characteristic surface details, little inconsistencies produced by nature but lost in specimens that have been blasted too aggressively. The more rare spiny trilobites like Hoplolichas, Boedaspis, Paraceraurus and so on are for the most part very carefully and skillfully prepared and therefore, very expensive. Fake trilobites are known even from Bolivia. I have not had a chance yet to take a look at such material myself but we have been assured that there are assembled trilobites on the market as well as complete fakes made of plaster or resin including both positives and negatives, so watch out! 1. air bubbles in matrix and exoskeleton as signs of resins. If you discover tiny holes in the matrix or the trilobite exoskeleton you can assume you are dealing with a fake trilobite. These tiny holes, usually less than 0,5 mm in diameter, are the results of bursting bubbles of air that formed during the hardening process of the resin used to cast the trilobite. (see Picture1). 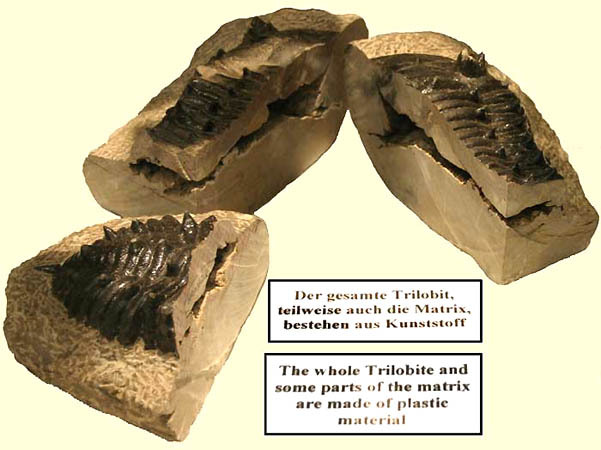 Picture 1: A) simple fake, a Drotops trilobite completely made of resin, the cast trilobite then mounted onto the matrix, the tiny holes in the resin surface can be easily seen. B) magnified view of part of the axis. 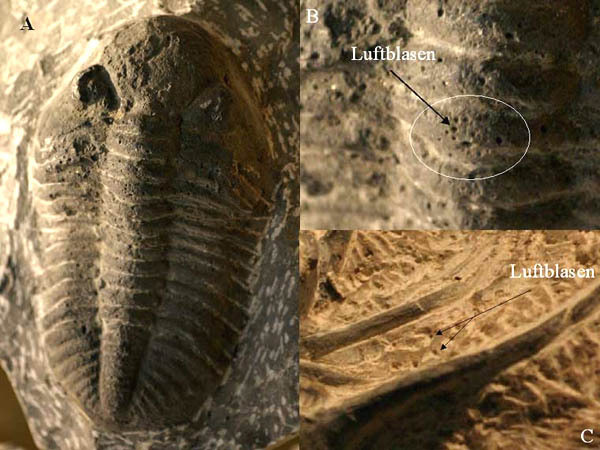 C) air bubbles in the matrix of a faked Dicranurus indicate that the trilobite including underlying false matrix has been mounted onto a piece of real rock, the resin shows an unnatural brown color, real matrix should be of a dark grey. If you find different colors in the matrix of Devonian trilobites, for example a light brown close to the trilobite while the rock, once you turn it over, is of a dark grey, this indicates there may be trouble ahead. Usually the rock is of an evenly dark grey (Hamar L’Aghdad), reddish or light yellow (Laatchana) color. If there are differences in color as described and in addition to that very extensive preparation marks on the surface (to hide tiny holes), then both the trilobite and an underlying layer most likely were cast and later mounted on some real piece of rock. In Cambrian giant trilobites you can sometimes find color variations of the matrix that may indicate that the specimen was assembled from different individuals. Look for thin lines were parts may have been glued together with their respective colors. Trilobites without tampering should have an evenly level and colored matrix. If you cannot find any crack line in Devonian trilobites that can be followed on throughout the surrounding matrix then be suspicious. These crack lines are characteristic for authentic trilobites from the very hard rocks of the Devonian of Morocco. It is hard to find a trilobite without splitting it with your hammer. The absence of a crack line may be an indication of a fake trilobite so take a close look. The exoskeleton of most Moroccan trilobites is of black, in some rare cases of dark brown or olive color. 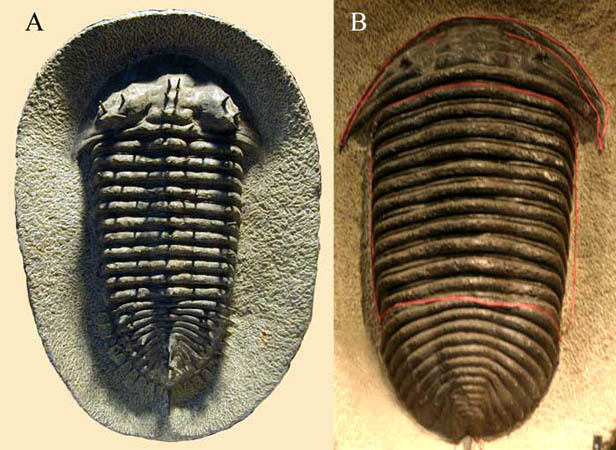 Many faked trilobites show different colors, often brownish, with an unnatural shine to it. Making careful use of your front teeth, you can test the trilobite for authenticity. Fake trilobites will feel “soft”, like plastics. This method is simple and safe at the same time, because the nerves in your teeth are sensitive enough to tell the difference without damaging the specimen. Authentic trilobites are much harder than faked ones made of resin. Try it using your toothbrush and some piece of rock. But please be careful, a slight touch will do, don’t try and bite into it! As far as trilobites from the Ordovician and Cambrian of Morocco are concerned, their exoskeleton has been replaced with hydrated iron oxides like limonite, the color being a shade of brown or orange rather than yellow or black, as has been seen in some faked trilobites. Picture 3: these trilobites are authentic specimens, for only if you know what real trilobites look like will you be able to identify the faked ones. The Paralejurus on the left shows the characteristic crack lines of a Devonian trilobite (marked by arrows), the upper one clearly visible on the cephalon, the lower one not so obvious. Top right: clearly visible terrace lines on the pygidium of the Paralejurus. These lines will be missing in faked trilobites or specimens that have been treated too aggressively with a blaster. Notice the tiny white spots, they are preparation marks resulting from direct hits with the tip of the prep needle but of course, they will also be gone once a blaster has been used in the manner described. Bottom right: the individual eye lenses of trilobites of the order Phacopida are a sign of authenticity because they are (still) hard to fake. It should be noticed, though, that schizochroal eyes are peculiar to the Phacopina, which are abundant in the Devonian of Morocco but of course there are other trilobites as well (Lichida, Harpetida, Proetida). The exoskeletons of real trilobites very often show fine structures, inconsistencies and ornamentations, there are terrace lines (see the Paralejurus above), little knots, knobs and spines. Taking a close look at the trilobites’ eyes will be helpful as, e.g., the Phacopina have schizochroal eyes, the individual lenses clearly visible to the naked eye. 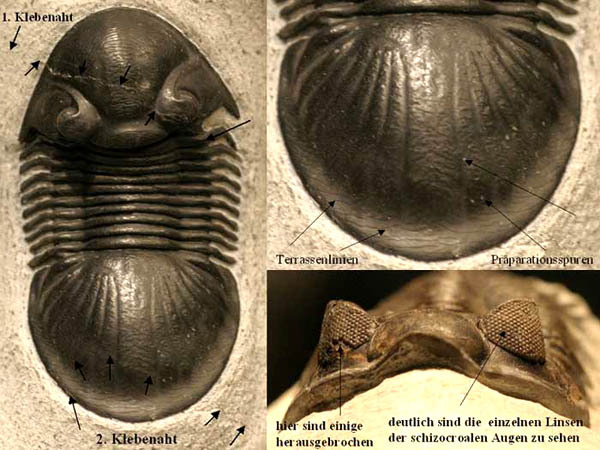 Faked trilobites usually lack these characteristic details … it is hard to copy nature perfectly. Faked Phacopina usually have smooth eye surfaces, because the production method of cast trilobites does not allow for such details to be reproduced. If you are not sure whether you are dealing with a fake trilobite a UV-light may be of assistance. Resin reflects ultraviolet light and therefore starts gleaming when exposed to a UV source. A real trilobite is mineralized, it has the same reflection habits as the surrounding matrix. Be careful, however, when testing waxed or finished trilobites like those coming from Russia, they may start gleaming under UV light and still be “real”. Waxing and finishing is a commonly used method to increase contrast or conceal minor damages to the exoskeleton. Moroccan trilobites sometimes are covered with an unidentifiable black paste, both real specimens and faked ones. We use a solvent like Aceton or Bindulin to remove such patinas from trilobites. Take a paintbrush and confront your trilobite with the solvent and within seconds the paste will come off, as do other artificial colorings. Use the solvent on real trilobites to remove the paste and see what remains ….. perhaps not too much, if you are unlucky. If there are restored areas they will appear white because the color came of. 7. The ultimate and final solution – the saw! If you are still in doubt about the authenticity of your trilobite then saw it up with an appropriate saw (diamond-covered blade). Is there is a hypostome present? Bad luck - chances are you just sawed up a real trilobite! is there a hollow area underneath the trilobite and resin has been used? Then your trilobite was fake but it should not be necessary to saw up your specimen unless you want to prove its lack of value 100%. Picture 4: a completely faked Burmeisterella, the hole underneath the cast trilobite can be easily seen, the use of a shiny finish to pretend a real trilobite exoskeleton is evident. This fake was 25 cm in length. Photograph taken by Sonntag, specimen owned and sawed up by Burkard. Frequently seen at shows are the combinations of various faked trilobites on a single plate. I call this a “faked assemblage” (see pic. 5). These plates tend to be circular in shape, thin and slightly hollow. I have even seen clocks mounted to the center, surrounded by cast trilobites. There are simply no such assemblages in nature. This does not mean there cannot be several authentic specimens on a single plate, it simply means there are no such natural parties of different species that often do not even appear in the same geological formation. Picture 5: completely faked trilobite assemblages, all made of resin with an underlying layer and mounted onto real rock, casts identified as: Leonaspis, Walliserops, Crotalocephalus, Paralejurus, and something unidentified on top (left image),Odontochile, Psychopyge, Phacops and Scutellum (right image). Photography: Sonntag, specimens owned and sawed up by Burkard. Some of the most impressive fakes coming from Morocco are the complete "Burmeisterellas" (Picture 6). To the best of our knowledge, unto this day, no authentic complete specimen of this kind has actually been found in Devonian of Morocco. It has to be said that all complete specimens we saw so far turned out to show manipulations, at least. Burmeisterella belongs to the Homalonotidae, close relatives to the Calymenia. The partial remains of these large trilobites are found isolated in the Devonian of Morocco. There do not seem to be complete specimens. They make for very impressive trilobites and it is no wonder that inventive Moroccans took all the parts they could find, cephalons, pygidia, pleurae, etc., and assembled them to form what they believed would represent a complete specimen of this genera. They just took every rock that was found to contain parts of these Burmeisterellas, extracted the parts completely from the surrounding matrix and collected them until they had everything they needed to assemble a trilobite. According to Mr. Burkard, the Moroccans exchange missing parts among each other: "I need pygidia of this spiny trilobite and I have pleurae of that species that you are looking for, let's make a deal." Picture 6: The "Homalonotida"- Fake. A: Spiny Burmeisterella sp.? (Spines are actually tiny Orthoceras glued onto the exoskeleton, real trilobite parts are assembled and fixed with resin onto a prepared piece of real matrix. B: Smooth Burmeisterella sp.? Cephalon and pygidium of this trilobite consist of real trilobite parts, the thorax section marked by the red lines is made of resin. Both faked specimens are approximately 25 cm in length. Photos: Sonntag, B: Photo from the collection of Burkard. P.S. 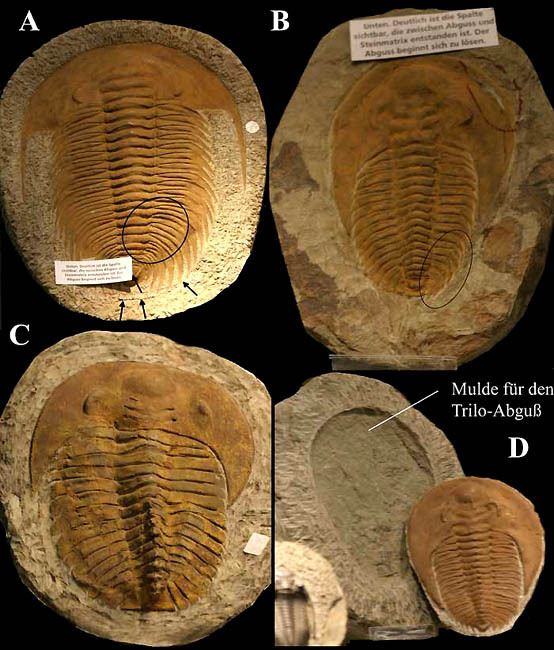 In 2002 Heiko and I saw these "trilobites" for the first time and were both fooled. Picture 7: more examples of faked Homalonotida from Morocco. A: the red stripes mark the resin in between the assembled pleurae, the right side of the pygidium was most likely broken off, so the right pleurae were shortened in order to pretend that the trilobite was still partially buried inside the matrix. B: cutting right through the "trilobite", the red lines and spots marking areas made of resin, the whole thorax, the free cheeks and the anterior border are faked and made of resin. C: a sawed up spiny Homalonotid, the spines are actually tiny Orthoceras, real trilobite parts appear yellowish while the resin looks grey. Debris of rock has been mixed with the plaster used to save material. All photographs taken by Sonntag, trilobites belonging to and sawed up by Burkard. The giant Paradoxidae from the Cambrian of Morocco are well-known and sought-after trilobites worldwide. It does not surprise that these trilobites have become the subject of extensive faking activities. The demand is satisfied by producing false material either assembled from isolated trilobite parts or completely made of resin or plaster. These fakes now seem to represent the major part of the Paradoxidae traded and it is not that easy to acquire the real thing. At the same time, it has become more and more difficult to identify fakes (see Picture 8-A), although there are still some very bad ones around that can be easily told (see Picture 8-C), faking is an art itself! Picture 8: All Paradoxidae that can be seen here are fake! A: Acadoparadoxides briareus Geyer 1993: brown-yellowish painted cast trilobite, about 25 cm in length, fixed into an artificial mould using resins, the arrows marking a crack where the cast and the rock did not completely glue together, the circle marking an area where the artisan working on the cast failed the natural symmetry of the pleurae, it is quite certain that fakes of this nature have been sold in the past. B: Cambropallas telesto GEYER 1993: The same disintegration between cast and matrix can be seen in this image (red circle), the pleural tips have been created way too long and tipped (should look like the pleurae to the left), the whole trilobite about 15 cms in length. C: very primitive fake of Cambropallas, perhaps the rear section of the axis is real but everything else is made of resin or plaster, the glabellar furrows carved into the cast, proportions inadequate compared to the real thing. D: the cast has completely disintegrated from the mould it was placed in. Photos taken by Sonntag, Photographs A, B, D: collection Burkard. How can you tell fakes? For the most part, the trilobites are made of resin or plaster using negatives of real Paradoxidae, painted and then fixed into a mould dug into a real piece of Cambrian matrix. Because of the inadequate gluing between the materials used, the cast very often, partially disintegrates from the rock and tiny cracks appear along the cast/matrix-line (see Picture 8, A-B) or the cast disintegrates from the rock altogether and the whole construction falls apart (see Picture 8-D). As far as the cast itself is concerned, the same criteria that is already mentioned in the chapters on Devonian trilobites apply. The casts often look very smooth and symmetric, preparation marks and at least smaller damages that should be present in real fossils are missing. There are neither cracks or missing areas to the exoskeleton, remains of matrix between the pleurae or the characteristic features of the exoskeleton surface (e. g. the small tubercles on the exoskeleton of Cambropallas or terrace lines on the free cheeks of Acadoparadoxides trilobites). The natural color of the Cambrian Paradoxidae very often is being imitated by using a brown-yellowish paste that does not exactly match the real thing. 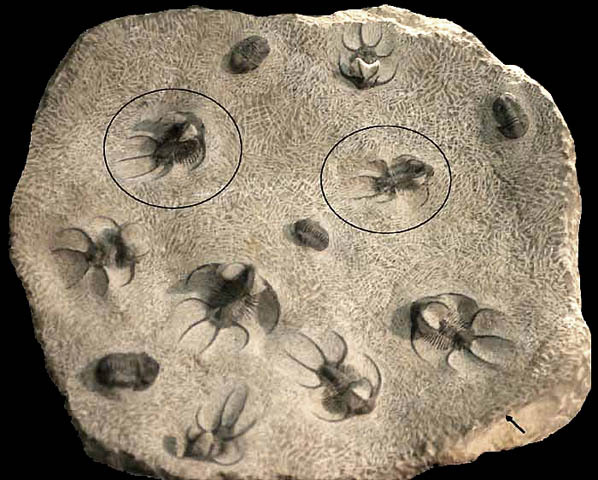 Many fake trilobites show a suspicious shade of yellow. The original exoskeleton of Cambrian trilobites has usually been replaced over time with hydrated iron oxides (often limonite) of red and brown color or yellow and brown, therefore jet black Cambrian trilobites have surely been the subject of manipulation, painted over to cover restorations, etc, and to create a "better contrast". The early days of trilobite fakes saw Moroccans carving trilobites out of pieces of rock, which sometimes led to very odd results due to the lack of morphological knowledge to produce convincing fakes (see Picture 9-A). In the beginning (and perhaps still today to fool tourists), not only trilobites were reproduced but scorpions and even snakes including zig-zag lines were carved out of and/or into the rock. I have seen huge wheels of ammonites completely fake. Well, maybe the artisan had a good day and turned the piece of rock he was sitting on into a nice huge ammonite - surely he will find a buyer for it. As already stated, the early fakes of trilobites were very primitive, made of a little plaster or resin and the details formed using a tool of sorts and before the material hardened. At times, this resulted in fantasy trilobites with large numbers of thorax segments or cephalons and pygidia that would not fit and/or were morphologically incorrect. 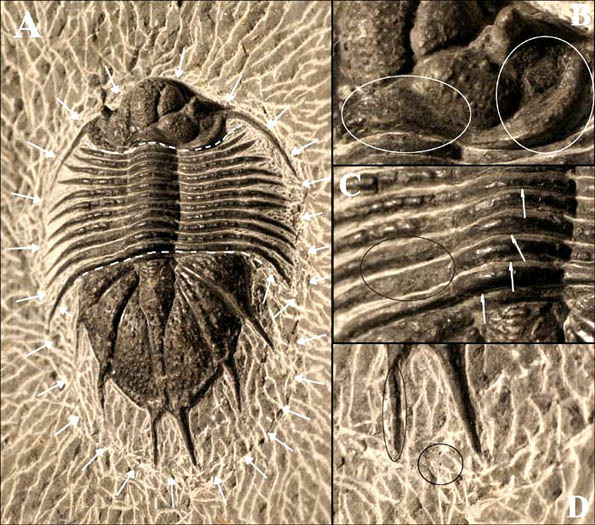 Perhaps the "trilobites" were created out of memory or from bad sketches. The problem, apart form the sometimes ridiculous morphology, was that the border between cast material and real matrix could be easily told. Because of that, the artisans very soon adopted the procedure to cover the whole chunk of rock with a layer of resin or plaster mixed with crumbled rock and perhaps a little color into which the cast trilobite is placed (see Picture 9 B-D). The trilobite is made by casting resin into a negative. The hardened imitation is then placed into the artificial layer, and once the whole construction is hardened, the border line between fake trilobite and fake matrix as well as the line between fake matrix and real rock is covered by extensive preparation gash marks to deceive the unwary eye and cover tiny holes resulting from bursting bubbles of gas in the hardening material. However, these preparation marks are very often way too irregular. After that, the whole creation is painted, often failing to reproduce the right color shades. The whole process of faking the trilobite takes two hours perhaps (excluding the hardening process that can take several hours to complete). A real trilobite, depending on the kind of trilobite and the skill of the artisan prepping it, will take at least 5 hours or more to complete, perfectly prepared specimens may have seen 100 hours or more. Picture 9: A: fantasy trilobite pretending to be a Phacopida from the early times of trilobite fakes (piece was acquired in 1983). B-D: good reproduction of Odontochile from the Lower Devonian of Morocco, produced 20 years later. Apart from the missing eye detail (lenses) the "trilobite" is morphologically correct and detailed but being cast and fixed onto a layer of resin or plaster on top of real rock. Photo B, bottom right, clearly shows an area of disintegration of the artificial layer from the matrix. Photos C and D show the smooth surface of the eyes, eye detail is missing, there are no lenses as with authentic specimens. This impressive trilobite from the Lower Devonian deposits of Morocco with its strange extension of the cephalon is very popular with collectors and therefore frequently subject to manipulation and fakery. Authentic specimens bear three rows of very fine spines (one row on the axis and one row on each side at the borderline between pleurae and pleural spines). The labor involved preparing these spines is very time-consuming and difficult work and a specimen perfectly prepared will cost a small fortune (4-digit sum in US dollars), but you will get fakes for a several hundred dollars! So, if you are looking for a bargain on a spiny trilobite, be very careful when coming across Psychopyge trilobites! A few years ago, an acquaintance of ours very proudly presented one of these specimens to us and was very disappointed when - after carefully investigating the trilobite under magnification - we had to tell him that it was fake. Because of its bizarre morphology, Psychopyge is also very popular with the general public on websites, at shows and in fossil shops, which may be one reason why this trilobite is frequently found faked in numbers, as mentioned. Cast single pieces with fake or real rock matrix have been selling for years. When we have a look at the faked Psychopyge in picture 10 below, what we notice is not only the brownish color and the many tiny bubble holes in the resin but the very crude preparation marks. You can tell a good preparator by the way he "cleans up" his workplace, namely the matrix surrounding the finished trilobite. A good preparator will try and give beauty not only to the trilobite but to the matrix as well by evenly roughening it and giving it a nice light color or by carefully blasting it after which it becomes a nice grey. The procedure also increases contrast between the fossil and the matrix. The intention to create something really beautiful is not too common with the people faking trilobites so keep your hands off stuff that does not look good or simply seems "suspicious". Picture 10: not too good a fake of Psychopyge elegans from the Devonian deposits of Morocco. Just another matrix imitation and a cast trilobite on top, both the trilobite and the underlying matrix were made of resin. A: very suspicious is the brownish-grey color of the trilobite (black would be normal), the surface of the exoskeleton is rough and full of bubble holes. B: magnified view of the cephalon - both eyes and glabella seem to have been somewhat carelessly modeled. C: the resin pleurae have obviously been carved a little, resulting in a sharp-looking appearance, again: note the bubble holes! D. the tail spines seem to have been carved as well with some sharp modeling tool, bubble holes again in both the "trilobite" exoskeleton and the underlying "matrix". Photography: Sonntag (We found this piece from a Moroccan dealer at a German fossil show). This trilobite has one of the most bizarre morphologies coming from the Lower Devonian of Morocco. Remarkable are the two very prominent horns on the occipital ring. The trilobite is rare and rather difficult to prepare. At least you cannot prepare this trilobite with simple tools as have been used in Morocco early on. 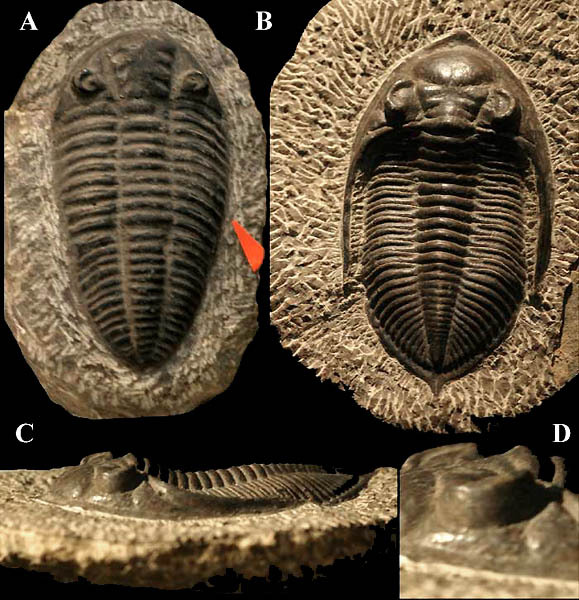 The difficult preparation may be one reason why there are so many fakes floating around, another being that this trilobite usually represents the more expensive kind of fossil. As already mentioned, the crude preparation marks indicate an old-style Moroccan preparation and should already raise a red flag. In many cases, the matrix (or resin with faked trilobites) in between the horns has not been removed (see Pic. 11). If the matrix shows a light brown color and the exoskeleton a shade of brown (straight black would be normal) then chances are you are dealing with a fake specimen. 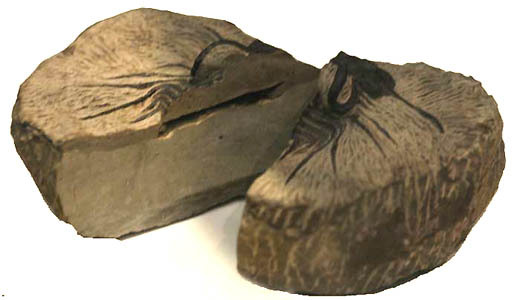 Like with the other trilobites we discussed the fakes of Dicranurus mostly consist of both the trilobite and a matrix layer being cast from resin or plaster and then glued on top of a chunk of real matrix, the typical "imitated-matrix-fake". Well-prepared GENUINE trilobites of this species frequently show free-standing horns. Picture 11: A typical Dicranurus monstrosus fake, about 10 cm in length. A cast trilobite and a cast layer of matrix glued onto a chunk of real matrix. 1: frontal view of Dicranurus, clearly visible are the crude prep marks pretending to be the real thing. 2: the pygidium under magnification. Note the circled tiny holes resulting from bursting bubbles of gas during the hardening process. 3: The pleurae have obviously been manipulated using a sharp carving tool, the pleurae looking very sharp, real ones are circular in shape. 4: cephalon under magnification: note the partially removed color from the left horn to prove the fake and reveal the light color of the resin used. During the Hamburg Fossil Show, we came across a very well-done fake of Acanthopyge (see Pic. 12) which is a relatively large Lichid trilobite from the Devonian of Morocco (the specimen we are talking about was some 10 cm in length but there are larger ones around). Complete specimens of this species are rare and this fact made us look more closely. The dealer had a second complete specimen which already raised a red flag (and several obvious fakes of Psychopyge lying around). We were pretty sure that the trilobite had been manipulated, so we decided not to buy, instead took out our magnifying glasses and cameras and took a few shots of the specimen but we were not able to tell right away what exactly was wrong with this trilobite. It was not until we investigated the photographs more closely and with various zoom levels on our laptops later on that we slowly discovered the truth. I had convinced myself during the show that at least parts of the exoskeleton were real, using the tip of my teeth to test the hardness of the shell. I did this test on both the cephalon and the pygidium. But we had noticed that the trilobite had been mounted onto the matrix (see Pic. 12 A), particularly in the bottom right area the badly concealed line were the parts were glued together was evident. The question was: Why should an apparently real and complete specimen be mounted onto alien matrix? Perhaps because it may have a better look then and reach a better price when sold? I did not think so. Taking a closer look at the images taken during the show we soon came to the conclusion that the genal spines (and parts of the free cheeks) as well as the eyes (carved from matrix) were false. The pleurae are, for the most part, authentic as are both the cephalon and pygidium. We are now convinced that the trilobite was assembled from parts of several individuals or perhaps disarticulated remains of a molt. All parts may have been present but no longer in the right position or, as already mentioned, the individual parts of the trilobite have been collected over time to finally assemble this particular "complete" specimen of a rare trilobite. We are facing the same trick that has already been used in the Burmeisterella fake, perhaps slightly altered. An authentic chunk of rock from the same level that has contained the Lichid-parts with a mould dug into it and the parts of the trilobite, carefully cleaned of any real matrix, reassembled on top of a matrix imitation made of resin and plaster which was then glued into the mould. Again, the resin being mixed with powdered rock material and easily identified by the little holes resulting from the bursting bubbles of gas during the hardening process (see Pic. 12-D). It must have been tricky to isolate single pleural segments from their matrix. It looks as if this effort was not always successful and that parts of the pleural segments broke into pieces and therefore needed to be restored. The first five segments do not seem to have been artificially assembled, perhaps this part of the thorax was still present as a whole. In the area of the pygidium, the borderline between authentic rock and mounted resin can be easily seen, the artisans have taken more care to conceal this line in the area of the cephalon. I have to admit that the people faking this trilobite have made great efforts to produce “good” quality. The question is “why”? Heiko told me, that he had heard that the locality where the Acanthopyge was found was running out of material. It seems the digging reached such an extent that literally half the mountain is gone. In total, only a handful of complete Acanthopyge specimens seem to have been found, 40 specimens perhaps, that’s a pretty small number for Moroccon trilobites. However, this may serve as an explanation why people have invested so much time in fabricating trilobites of this quality ….. for the simple reason that there are not any new specimens to be found and since Acanthopyge trilobites reach high prices on the market, it adds to the lure of making money with fake trilobites. Many Ordovician trilobites of Morocco are found complete and well-preserved within geodes (e.g. Flexicalymene and Asaphellus) so there is little reason to fake THESE TYPES. It is a different matter when it comes to spiny Ordovician trilobites like Selenopeltis (Pic. 13), which is a typical representative of the Gondwana trilobite fauna, found both in the Czech Republic as well as in England and Morocco. In Morocco however, Selenopeltis is usually found in very hard, fine grained, grey-white rock. The hardness of the rock requires careful and skilled preparation and it is both difficult and time-consuming to extract all the spines. It has to be assumed that these trilobites cannot be extracted from the rock by simply splitting it as with many other trilobites from the Ordovician because parts of the exoskeleton very likely will remain stuck in the negative and have to be prepared onto the positive later on. The difficulties in preparing, the rare occurrence and the high value of these trilobites add to the lure of fabricating. Horst Burkard has acquired a fake specimen of Selenopeltis. The fake, however, is easy to tell. The trilobite’s exoskeleton is of a brown color when it should be black (see Pic. 13-A). We are dealing with a cast trilobite glued onto a chunk of rock. The connection was not very stable so that the cast has already started to disintegrate from the matrix. (see Pic. 13-B). The quality of the cast is also very low because many morphological details got lost in the process, e. g. on the glabella (see. Pic. 13-E). The length of the lower pleural spines is incorrect, way too short and clearly visible to the eye when compared to an authentic specimen. The artisan also failed to produce the mild shine of a real calcified exoskeleton. The fake trilobite has a rough surface while the real stuff is very smooth and shiny. The sediment is of an equally bad quality. Picture 13: Selenopeltis sp. from the Middle Ordovician of Morocco (Caradoc). A, D, F: authentic specimen, collection Burkard; B, C, E: faked Selenopeltis trilobite, A: authentic specimen, about 15 cm in length, embedded in white sediment, some of the pleurae seem to have already been broken off before the trilobite was embedded. B: cast trilobite made of resin, cast is disintegrating from the matrix that it was glued onto, pleural spines way too short, lack of symmetry in the axis; C: magnified view of the area of the pleurae and axis, the resin displays a rough surface; D: the same area (but right side) with the authentic specimen shows black color and light reflecting characteristics, the axis is not that well preserved and therefore displays some rough spots; E: the head shield under magnification, segmentation of the glabella not visible, glabellar lobes hardly to be seen; F: the authentic specimen shows all morphological details. Both specimens: collection Burkard, photos taken by Sonntag. Reputable dealers usually do not display at small local shows and festivities. The danger of acquiring false specimens is very high there. Even at regular specialized shows, there will be black sheep. We had the pleasure of meeting many reputable Moroccan dealers at those shows but at the same time many who also sold junk and fakes. Be careful when coming across multiple-specimen-slabs, the shapes of which appear soft, the exoskeletons rather dark grey or brown instead of straight black. Be extra careful when the dealer is insisting on its authenticity, it’s “one-of-a-kind” status and that he will sell it to you cheap anyway. (see. Pic. 14). Picture 14: slab of about 25 cm in diameter with obviously mounted specimens of Ceratarges and Proetus, the circles mark color differences which indicate badly concealed manipulation, the arrow bottom right indicates a brownish area that may represent faked matrix. It is likely most specimens displayed here are cast trilobites made of resin, but perhaps this time the artisans have simply used authentic Proetus trilobites and badly prepared Ceratarges and mounted them onto the slab to form this particular piece. Photo taken by Sonntag. At the beginning, I spoke about restorations of trilobites and would like to be a bit more specific about that. The question always is: what is justifiable restoration, where does it end, where does the fake begin? Because of visual reasons and sometimes because of higher revenue (that’s where the fake starts), trilobites are being “restored”, small parts, a missing spine or an eye are replaced using resin but resin should only be used in very small quantities. The more resin is used, the less valuable the trilobite is going to be. Replacing a whole free check in a trilobite molt - then in my opinion the line has already been crossed. Minimal restoration, just millimeters in size, may perhaps be regarded as ok but that’s about it. In the end, most trilobites are found using a hammer and in danger of the trilobite being damaged. That’s just the way it is and cracks in the trilobites do not have to minimize its value. 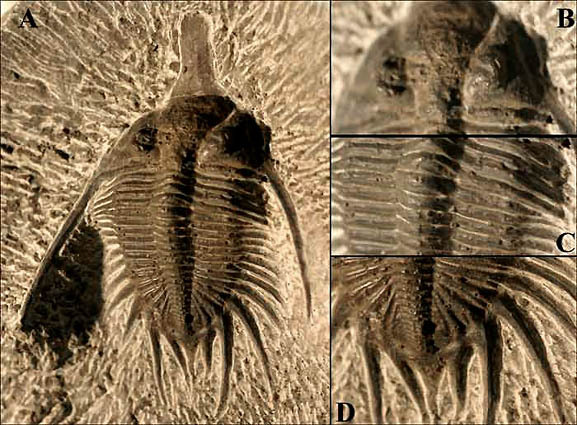 Perfectly preserved trilobites without any cracks are very, very rare. Browsing trilobites for sale with common sense, open eyes, a magnifying glass and a good portion of suspicion is a good policy to escape fakes. Look at what the dealer is selling. Does he sell lots of cheap and badly prepared Moroccan trilobites (we do not even have a look at these specimens any longer because there is hardly anything to be saved) or does he in general, sell high-value preparations only? 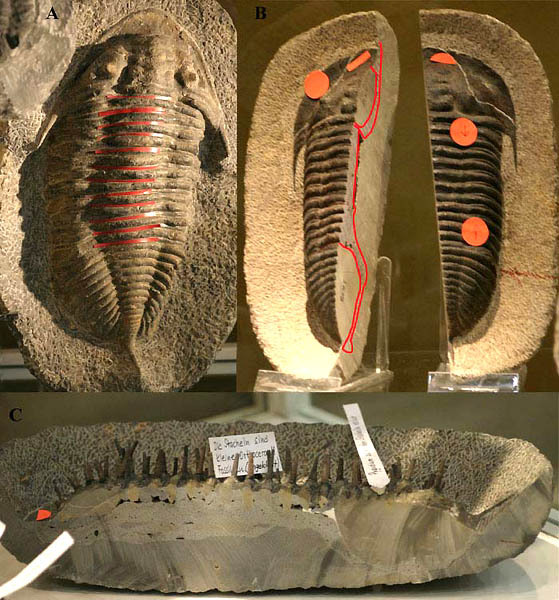 Get informed about the average sales prices of well-prepared trilobites, e.g. using the internet. Try it by using a search engine and a familiar genera and be reminded that quality has its price! 94-99, 8 unn. Abb. ; München. München, Turmalin und Trilobit: 136-144, 22 unn. Abb., München.